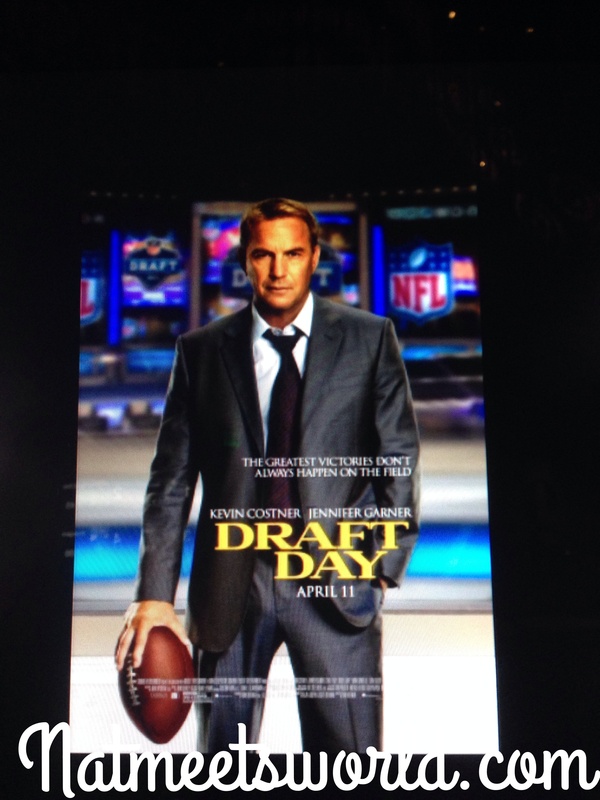 Last night, some of my friends wanted to see Draft Day at iPic Cinemas. When they first mentioned it to me, all I thought was, great, now I have to sit and watch a bunch of men run around and act barbaric. I then thought about how all of my buddies always watch my girly movies, so I put a smile on my face and went with it. Draft Day stars Kevin Costner and Jennifer Garner in a movie about the general manager of the Cleveland Browns (Costner) and his fight to rebuild his ‘dream team’ on the NFL draft day. He must choose what he is willing to give up for a couple hundred college players with dreams of making it big in the NFL. After watching the film, I was glad I ended up going to see it! It wasn’t as ‘footbally’ as I thought it would be. Instead, I really loved how the message behind the storyline relates to character building and life lessons that viewers can relate to. It showed how some college players are driven and humble and strive for excellence. This is what pulled at my heartstrings (as a teacher), and made me love the film. I also appreciated the little bits of humor and the love story that was included in the movie. I never knew how intense the NFL draft was and all of the people and planning that are behind the scenes of it. So what is the ‘but’ of this review? If you don’t know about football, be prepared to be confused! There are a lot of acronyms and code words that had my eyebrow lifted. I kept whispering questions to my friends because I just didn’t get it. The toughest part for me was the explanation of the trades that go on between teams. Nothing irritates me more than being confused during a film, so this was a little annoying. Next time I watch a movie like this, I will make sure to ask how the draft works ahead of time. If I had to choose, I would have waited to see this on DVD and not spend the money at the theater, however, it meant more to me that my friends and I spent time together. They however, would not have waited for it to come out on DVD. I guess it just depends on your love for the game, you know? Have you seen Draft Day? What did you think about it? Comment below! Disclosure: Draft day picture and opinions are my own. « Mojo Donuts Is A Must For Donut Lovers!